Put a large saucepan of water on to boil and pour some table salt into the palm of your hand and place into the water (always salt the water when cooking pasta which will flavour the pasta as opposed to salting it after it’s cooked!). When boiling add the spaghetti to the water and cook until al dente. Meanwhile put a frying pan over a medium heat and add a lug of cooking oil. I like to use Newgrange Gold rapeseed oil. When the oil is coming up to temperature add the garlic and be sure not to let it burn. Add the cherry tomatoes, capers, and olives. Give everything a stir and leave to cook, stirring occasionally. You want the tomatoes to break down to become lovely and soft. Towards the end of cooking at the pine nuts to the pan also. When the spaghetti is cooked, transfer it directly from the cooking water to the frying pan bringing with it a little of the cooking water. This will keep the spaghetti lovely and glossy and will help to mix with the sauce really well. 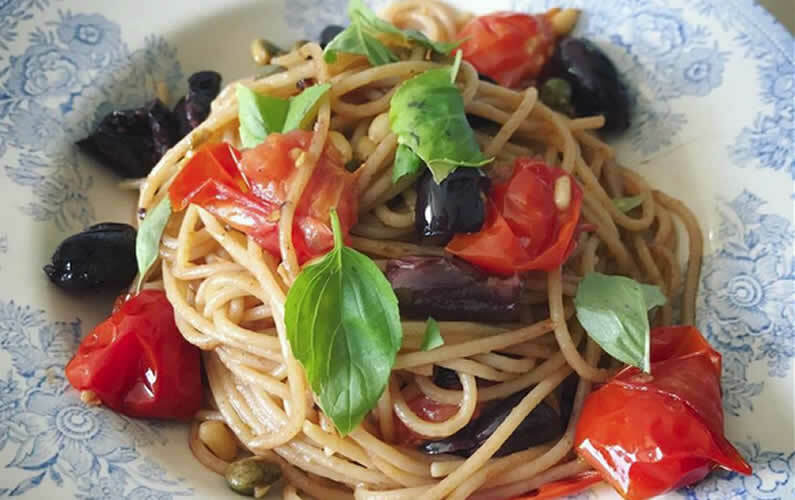 Toss everything together so all the flavours combine with the spaghetti and the piece de resistance is to drizzle with a good lug of Newgrange Gold Chilli & Garlic Rapeseed Oil which brings the whole dish together beautifully and tastes incredible! Serve in a pasta bowl with some torn basil leaves and tuck in!